Safely and securily store and charge all your devices simultaneously in this mobile lockable cabinet, sized for tablets, Chromebooks and mini laptops, including an extra bottom shelf for accessories. Accessible via front and rear doors. 100% Steel construction and covered by the manufacturer's Lifetime Warranty. This item also comes for 24 laptops (C LLTP24-B). Simply select 18 or 24 when ordering, by using the drop-down menu above the Buy Now button, on the left of this page. We also have Laptop / Tablet security storage cabinets for 12, 16, 18, 24, 30 and 42 units. Please contact us with your questions. The LLTP18-B is the perfect solution to charging and securing up to 18 laptop / tablets. Cabinet and laptop shelf come fully assembled. The rack shelves are 20"W x 16"D. Each shelf holds up to 9 laptop / tablets (12"H of top clearance). Each rubber-coated divider is 1¾: apart to keep your equipment organized and protected. Devices must not be larger than 16 x 12 x 1 3/4. Bottom shelf space is perfect for storing accessories and equipment (4½"H of top clearance). Includes vertical electrical outlets for maximized space. Electrical cords can remain powered through two small holes on the bottom of the unit. Plenty of ventilation allows air to circulate freely through the unit. Includes four 4" full-swivel ball-bearing casters, two with locking brake. The locking doors include a traditional lock and key system, Includes a set of two keys. 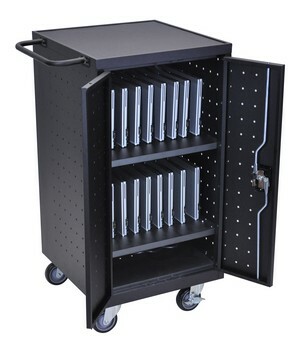 We also have Laptop / Tablet security storage cabinets for 12, 16, 18, 24, 30 and 42 units.